Posted on February 1, 2017 February 10, 2017 , in Hot Tubs. Thinking through your hot tub purchase before you buy is essential to choosing a product that is right for your lifestyle. But how do you know what to look for and what to avoid? Below, you’ll find out about mistakes consumers often make when buying a hot tub so you can avoid them. While lower-priced hot tubs can save you money initially, they usually end up causing problems in the future. It’s important to remember that high-quality hot tubs cost around $6000 while lower-end options cost around half that. Cheap hot tubs can be deceiving because they often work well for a period of time, however they are not typically reliable in the longrun, which will cost you a lot on maintenance, repairs, and chemicals. Rather than calculating how good a deal a hot tub is, think about what it will cost you over the course of its life, including how much it will cost to run. You can ask your dealer to give you the monthly cost of running each model. You’ll likely notice that higher-end models are more energy efficient and require less maintenance, all of which will save you money. While a hot tub’s exterior may seem unimportant, low-quality hot tubs are susceptible to cracks, fading, and other problems. It can be hard to tell whether a hot tub’s exterior is strong by looking, as exteriors can look remarkably similar. To make sure you choose the strongest possible exterior, look for those that feature an acrylic or thermal plastic shell along with a vinyl ester resin skin coat or bond laminate. Also make sure to investigate the cabinetry. The best cabinets will protect the hot tub against cold, heat, and UV rays and be simple to maintain. Also choose a model with support beams that stretch from the lip of the hot tub to the seats and floor. When you buy a lower-quality hot tub, you’ll spend a lot more time maintaining it, which means you’ll have less time to enjoy it. It’s impossible to find a hot tub that requires zero maintenance, but there are options that will dramatically reduce how much time you spend. First, choose a hot tub with a pressurized filter system. These systems are highly efficient because they filter from both the top and bottom of the hot tub. Next, check to see that the hot tub has features that will facilitate cleaning and draining. It’s a bad sign if any dealer tries to sell you huge quantities of chemicals or other supplies. This won’t make your hot tub cleaner and it’s likely that you’re investing in an inferior model. To keep your cover in top condition, use a water repellent every few months. Most people invest in hot tubs because they provide therapy for back, leg, and neck pain as well as sports injuries, stress, and insomnia. But without properly structured, high-quality jets, you won’t receive the full therapeutic benefits. Look for a hot tub that features an adaptable jet structure. This will ensure that it’s capable of providing many different massages so you can get the therapeutic experience you’re looking for. Also make sure you can customize your massage with jets that allow you to adjust the water flow. 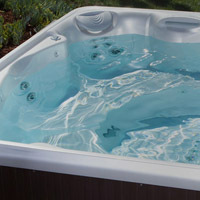 Many people purchase hot tubs without having any idea of where it will be located or where the best location might be. Make a plan before you invest and never put your hot tub in an area that floods or is near damaging sand. Instead, place it in a level location. If you’ll install on a support structure like a deck, make sure it’s sturdy enough to support the weight of the hot tub. If you’re unsure about whether a structure can hold your hot tub, ask an engineer to check it out. Otherwise you can risk damaging your hot tub and your deck. You want a warranty that will keep your hot tub in great shape without costing you a lot of money. That means you’ll want to avoid pro-rated warranties which require you to pay a portion of the repair costs. • An equipment warranty for 1 to 3 years. This will cover you against leaks, cracks, plumbing problems, and shell issues. One of the most common mistakes consumers make is purchasing a hot tub at an expo. It looks like you’re getting a great deal on a hot tub, but in reality you’re usually overspending on a low-quality hot tub. Instead, work with a dealer and research both the dealer and the hot tub manufacturer before you buy a hot tub from them. Independent reviews and customer referrals are great ways to get the information you need. Also work with a company that has substantial experience in the industry, will offer you a terrific warranty, and that produces quality hot tubs. Now that you have the information you need to choose a quality hot tub, download our buyer’s guide and learn about the many hot tub options available.